Speaker 1: It’s that time of the week, where we answer some of your common health questions. 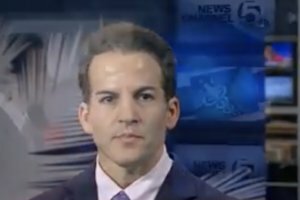 Joining me, News Channel Five’s medical expert Dr. David Soria, the Chief of Emergency Medicine at Wellington Regional Medical Center. I feel like the topic today is pretty timely. We’re talking about jellyfish, how do you stop the pain when one of them stings you. Dr. David Soria: Yeah, well this is a common occurrence this time of year and certainly gets even more common throughout the summer as more people go in the water. Remember three steps, neutralize, remove and treat. You first want to, when the stinger or what’s called the nematocysts are on you, you want to neutralize them. Vinegar or salt water, preferably warm, that helps kind of deactivate those cysts so they stop stinging. Then, you want to take either a shaving cream or maybe a sandy paste, put it on there and then take a credit card or something with an edge and scrap it off. You don’t want to squeeze them because that could squeeze more venom in. Then once you get the stingers off, then you’re gonna have something inflammation and a rash from it, from the stings, so you want to treat it. Nonsteroidal like Advil, Benadryl for the itching, and that typically will last for a few days and it starts to go away on its own. Speaker 1: I know where you were going. Dr. David Soria: Everybody kind of hears this and where it came from, we don’t know, but don’t want to urinate on the area. It doesn’t work, if anything, it makes it worse, so no need to do that. Speaker 1: I saw that smirk and I knew exactly where you were going. Okay, so from jellyfish to bee stings, what’s the best way to ease pain there? 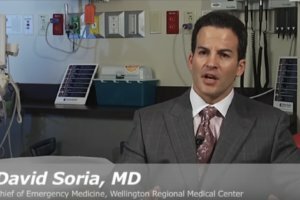 Dr. David Soria: Sure, sure, so very similar, it’s also a three step process, but first before we even go into that, I want you to remember that they can be very serious. It can cause a very serious allergic reaction, so if you develop shortness of breath, dizziness, inability or very, tightness in your throat, hives all over your body, make sure you call 911. People die from bee stings, alright, and very salvageable, don’t be one of those. If you have an allergy to them and you have an epi pen, use it if you get those symptoms. Okay, number one, remove, tweezers or with your fingers, scrap it off, don’t squeeze it as well, that can also cause the stinger to inject more venom. Take ice, put it on there for about 20 minutes, that eases the pain, decreases the swelling, and then also treat, Advil, something for the itching, steroid cream, maybe some Benadryl as well. And typically, a bee sting will go away in less than a day, so nothing to worry about folks. Speaker 1: Alright, keeping that in mind, we have to pack that away. We know we’ll have to use it one of these days. If you have a question for the doctor, we want you to send it in. Go to our website wptv.com, click on the health link, you’ll scroll down, and on the right hand side, you’ll see a form, write your question right there and we look forward to reading them. Thanks so much for coming in. We’ll see you next week.